Hi all, I thought I would post these pictures of a circuit I built some time ago , as it seems relevant at the moment, and maybe someone can help me to understand it better. 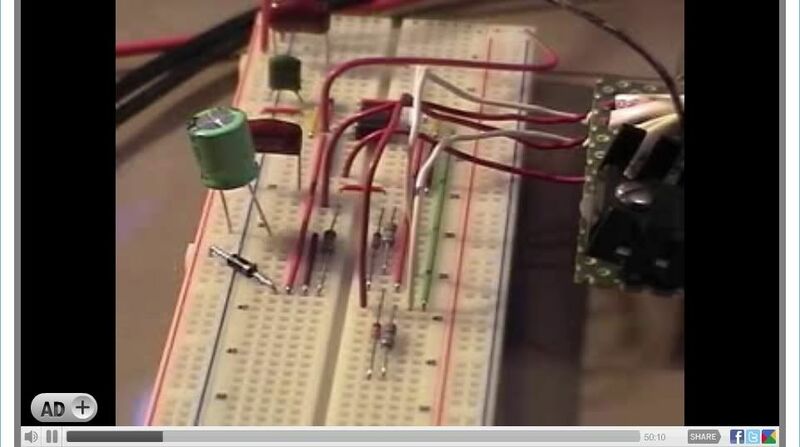 First - the breadboard shows a neat , cheap way of getting variable capacitance over a wide range. Pin2 of the 555 is connnected to the DIP switch bank -it is then possible to insert any desired capacitors , and parallel any combination of them ,to obtain any desired value. There are 7 caps in the bank here - the 8th swich was used for a variable cap ,to fine -tune the final value, but it is now soldered into another circuit. This circuit functions as follows : 6v battery powers 555 circuit.- output @pin3 [bottom trace of scope ], switches a reed relay. Secondary of coil is discharged through either a spark gap alone [ can be seen glowing], or spark gap + diode. 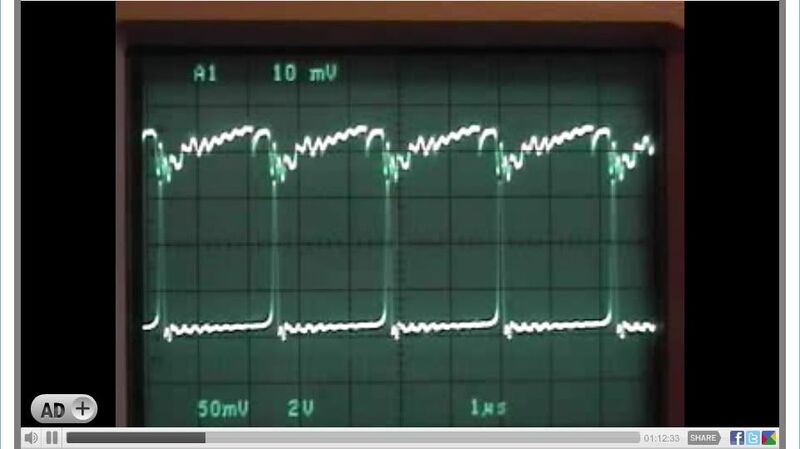 This is the top trace on the scope, and the v/division is 50v. 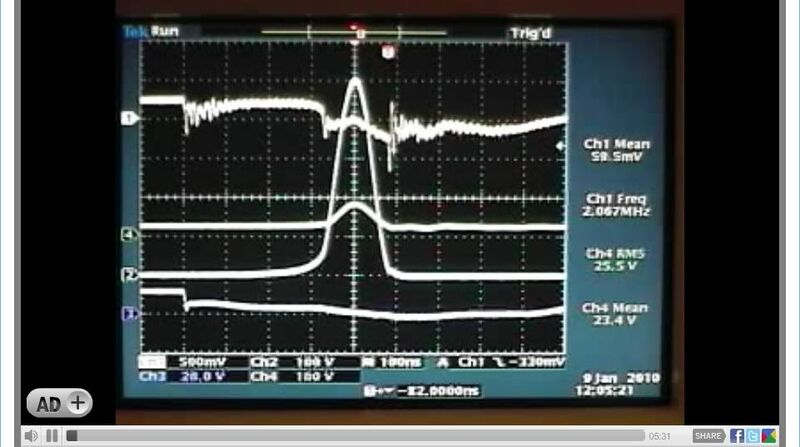 It clearly shows that the spikes are chopped by the spark gap @75v. If the gap was not there the spikes would be over 2000v. The time it takes to activate the relay is clearly seen. The AC ringing is clearly seen. The charging of the relay coil APPEARS to be capacitative? The discharge of the coil is inductive, but there APPEARS to be more energy expended than input if the AC ringing is taken into account. I use a variation of this circuit for mosfets - so any comments will be very welcome. There should be no need to try and read between any lines, the facts relating to our tests are available for everyone to evaluate. I have asked for others to evaluate them and offer their analysis but to date none have come forward with such. That request stands in perpetuity. Why the South African team is closed lipped with their research I can't say. All I know is that Aaron, Glen and Myself have presented Months of results for others to benefit from while we get nothing from Donny, His 'partner(s)' or the universities they are associated with regarding the testing and data gathering. Even the data from 2002 would be helpful, at least then we would know if we are truly replicating something or forging new ground. Judging from the waveforms in the patent applications, I would have to say it is the latter - but with absolutely nothing to compare it to but some vague memory of events 8 years ago who really knows? I even contacted ABB of South Carolina - they have no record of anything related to this. Perhaps I had the wrong ABB, who knows. So I take the view that if enough of us try this thing, surely someone will stumble on the same recipe they had in 2002 and get that huge 1700% output. It would be a shame for it to get archived with Bessler do to lack of interest. Please don't let my apathy and lack of ambition influence you. While I always keep an open mind and allow any person to present their argument to alter my perception of this reality in which we live, I must still have some evidence or sound logic to convince me to change what I know. Thus far, on this project, both have failed to materialize to my satisfaction - and many will tell you that I am rather easily persuaded. So, as you may be able to tell, I am in no rush as I await the results from team in South Africa and look forward to their success. Personally, I am not interested in making heat as there seems to be better ways to do that. But if there is extra energy in this that manifests as increased voltage in the BEMF spike, over and above that stored during the inductive charge, then I should like to identify it and put it to work. That will be my goal when and if I resume my tests. For now, I am running simulations on it to have a comparison to work against. Last edited by Harvey; 04-28-2010 at 10:54 PM. Do you have a schematic of your setup? If not, we could draw one up I suppose. It would be good to get everything labeled out for ease of discussion. 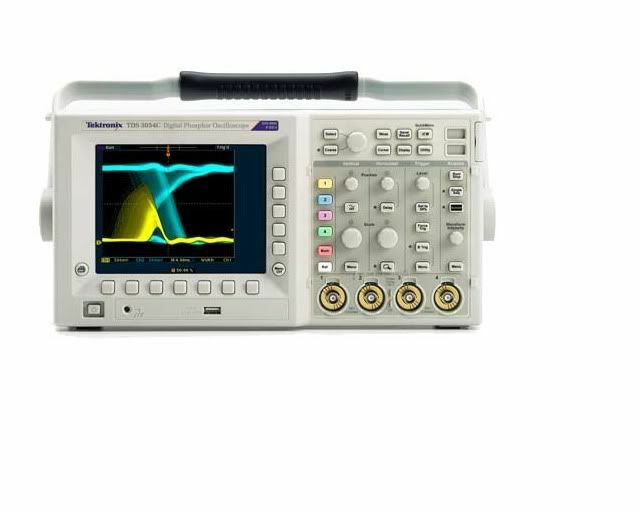 Any particulars regarding the scope would be good too - like timebase setting, AC or DC coupling, X1 or X10 etc. I like the capacitance switch - very handy. At most of the places I've worked in my younger years we had resistor, capacitor and inductor 'decade boxes' that made things easy. If Pin3 goes to the relay coil, isn't that the bottom trace in both pics? So the top trace is . . . the output with or without the diode? It would be interesting to see the primary vs. the secondary. Yes, pin 3 is the bottom trace in both pics. Ground is 3 divisions below the center line. I always use the scope probes on x10, and state the actual voltage seen. The time /division is 1ms in both pics. I measured the wave period as 6.25 divisions, giving a frequency of 160Hz. The trigger selector is set to DC and both channels are DC coupled. 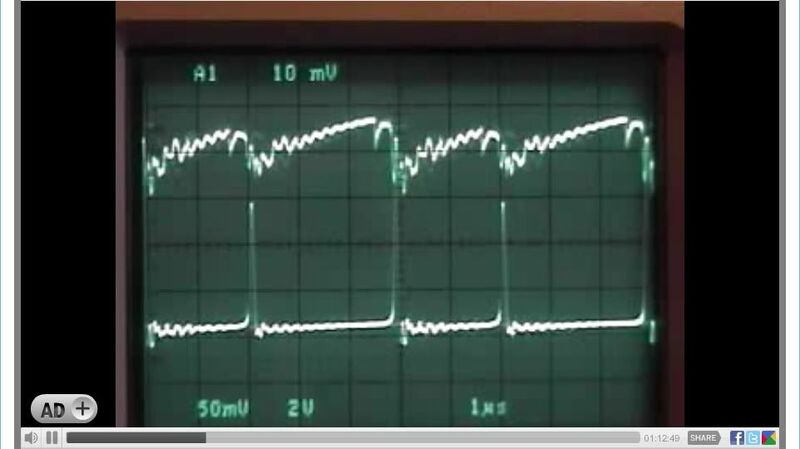 The top trace has ground set at 1 division above the centre line, and is at 50v/division.It shows the output of the ignition coil secondry, with a spark gap only [in one pic], and with a fast acting diode in series with the gap [in the other pic]. 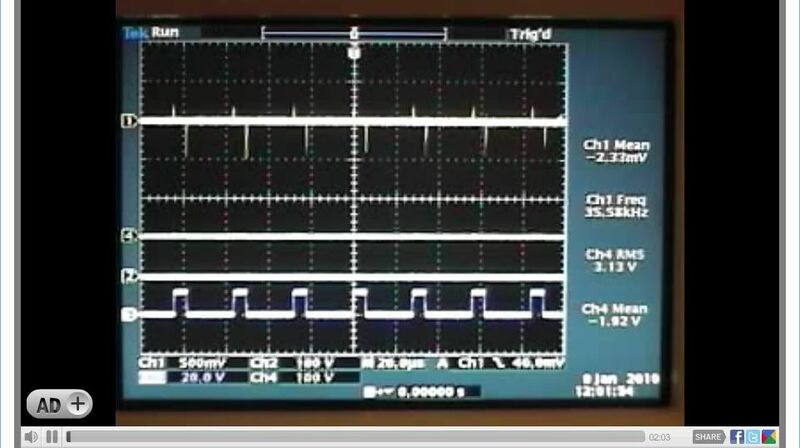 I have a pic of the primary /secondary, but both waveforms are exactly the same, except for a difference of exactly 100v. That makes this ignition coil a 100:1 step up autotransformer. I was surprised at how exactly the same the two traces are. I will try to get the circuit diagram done this weekend with the values as precise as I can get. This circuit is not vey practical - if I increase the frequency , the reed relay becomes erratic, and if I increase the power to the coil, the relay will burn out. But at this frequency, it gives me the best pictures I have ever got of the charge /discharge of an ignition coil. I measured the frequncy of the ringing to the best of my ability, and was surprised to find that it was 16kHz - 100 times the frequency of the waveform. Looking at the time that the spark gap is firing, on charge and discharge - they look to be the same without the diode, but there seems to be a lot of energy in the ringing as well. With the diode, there is appreciably less energy in the discharge, so the diode mut be dissipating a lot. When the relay contacts separate, there is a visible "shoot through" before the diode blocks the negative current, even though the diode is an MUR 140 with a 50ns reverse recovery time. Also , in this shoot through, there is a temporary reversal at about -12v. I dont understand this. I have to find my camera tripod and get some better pics, as the ones posted are a bit fuzzy. I will post them and the circuit diagram over the weekend. If I can get to understand this circuit it will help me a lot. If I have the layout in my mind correctly, and looking at your pic, does this look like what you have there? Last edited by Harvey; 05-01-2010 at 12:17 AM. I just logged in to post my schematic, and found you had already done it! - Which is great, as I am having severe trouble uploading mine - I cant get it small enough for the limits..Anyway, you got the 555 circuit spot on - amazing. pin 5 goes to ground via 0.01uf cap. There is an LED +7.5k resistor between pin3 and 6Vground. Q1 = 2N2222A,and this is where It starts to differ from what you have.The collector of the transistor is connected to 6Vcc. and the emitter goes to the relay coil through a 180R resistor.The other end of the relay coil goes to 6V ground.The 2 battery negatives are not connected [except by scope probe grounds]. The HV circuit goes like this : 12V battery positive is connected to one of the relay contacts through a 10 watt pot set at 40R.The other relay contact goes to the primary of the ignition coil. 12Vbattery negative is connected to the common terminal of the ignitiion coil. It also goes to the common pole of a DPST switch. One of the switching poles of this switch is connected straight to the spark gap, and the other is connected to it via a MUR140 diode [anode first].This enables the diode to be switched in and out at will. The other end of the spark gap is firmly connected to the ignition coil secondary. And that`s it - if you can follow it. When I built it -I wanted total isolation between the two circuits, but I forgot about those pesky scope grounds! I am still thinking of putting a separate ground for each channel in the scope. Your circuit looks interesting,but it is impossible to separate the common connections on these ignition coils- they are sealed. I might try it with a suitable transformer. Many thanks for your input - its very much appreciated, and it might seem off topic, but its not - and this circuit wont hurt anyone. THAT was unbeleivable - you have it exact as far as I can see. Except for D1, which is something I dont understand, but suspect might be an improvement ? - You got it through my garbled explanation littered with mistakes. I would love to see a simulated waveform , to compare with the actual ones that I am getting. Im going to have a drink! D1 is supposed to be a voltage controlled capacitor (varicap) as far as the part specification goes, but I just slapped that in there to represent your adjustable cap. It would need another series capacitor and voltage source at the cathode to function correctly. Some of the parts are not Spice ready parts (like the relay) and I would have to prep it to do a simulation. Right now I am spending my simulation time on my Big Coil when I get the urge to work on it which is not all that often. If I understood you correctly, your transformer is an ignition coil. These coils are made to withstand upwards of 30,000V on the secondary. Unless you have the capacitive discharge type, the principle behind their operation is that they support a very fast field collapse in the primary when the point contacts open. This very steep change in magnetic flux produces an extremely high negative BEMF pulse in the primary with nowhere to go (right at the point contacts) and this is stepped up by 100 times by your winding ratio. So a 300 volt negative BEMF on the primary will manifest a 30,000 volt negative on the secondary and that's what jumps the .030 inch gap on the spark plug in the engine. Your use of a resistor in series with the primary puts a limit to the current that can flow in the primary. This is because there is a maximum imposed due to the voltage drop across it. Even if your primary was a superconductor at zero ohms, there would be a 12V drop across the 40 ohm pot limiting the maximum current to 300mA. This directly effects the inductive charge of the primary - it may or may not be getting a full charge relative to its inductance, or how much the core can hold before it saturates and this plays a big part in how much BEMF is produced when the contacts open. This resistor also plays a part in the Impulse Response of the primary. If you look at the equation in that link you will find that Tau (1 time constant) = L / R. We usually assign 5 Time Constants (or 5 x Tau) to represent a full charge (even though, theoretically it never reaches full charge as each step is a percentage of the previous and just keeps getting smaller and smaller to an infinitesimal value) but 5 gets us to 99.99% full charge. What we see here, is that our time constants get shorter the greater the resistance. For example, let's say L = 200 and R = 40, then Tau = 5. Now lets increase R to 100 and we find that Tau drops to 2. So to put it simply, the primary of the coil responds faster with the resistor in series with it, but the overall energy is reduced (because it is spent on the resistor). That's the trade off. So you may be seeing that if you had a larger voltage source on the primary, then you could boost the energy level and get the benefit of the faster response. A 30V supply, and a 100 ohm setting on your pot would be about 9W dissipated, the current would be the same, but the charge time would be faster. Conversely, a 15V supply and a 25 ohm setting would still give about 9W dissipated in the resistor, but the energy in the spark would be greater as the current is doubled - while the impulse response suffers. You may also note that the way the diode is in the schematic on the secondary, it allows the positive impulse that occurs during the relay contact closure to pass, but it attempts to block the large negative BEMF induced pulse. It is probably being pushed into its avalanche region and producing the noted 'punch through'. By turning it around, we would maximize the function of this coil, keeping the positive pulse in the core to be used in BEMF collapse, and then allowing that negative spike to conduct fully through the diode. Chances are, in that case, we wouldn't reach avalanche - I haven't looked at the specs on that diode to see what it's limits are. Now to bring this on topic. To be a MOSFET Heater device, it would need a MOSFET in place of the relay, and it would need an inductive resistor somewhere - perhaps in place of the 10W Pot? Last edited by Harvey; 05-01-2010 at 09:00 AM. 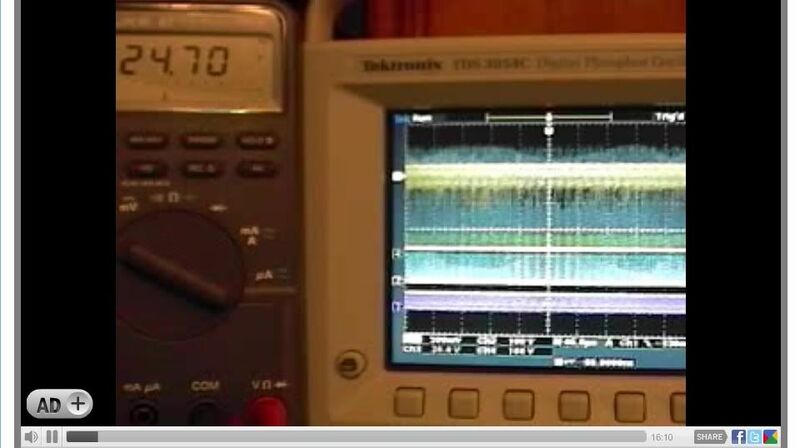 This post is a recap of my "LIVE" recording at "Open Source Research and Development" which is the best recorded representation of the preferred mode of operation a 5-Hour non stop video recording on January 9, 2010 using a Tektronix TDS 3054C Oscilloscope. 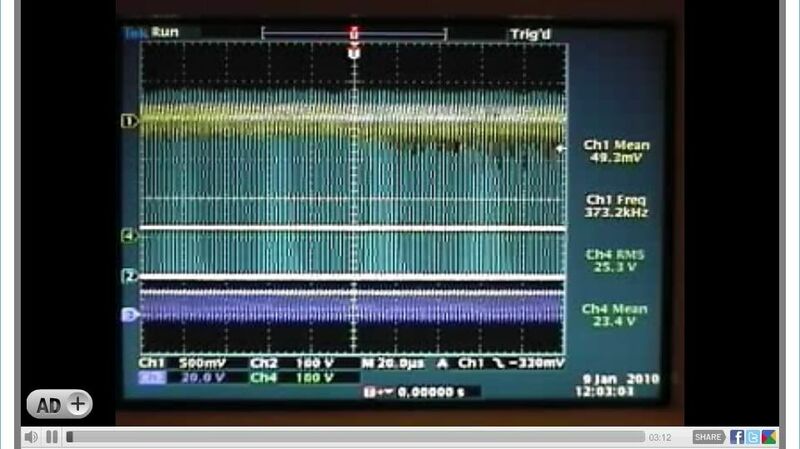 This 5 hour video recording is from a dead start after the scope calibration as all testing and evaluation of the circuit. Please see Image time bars for actual recorded times in hours, minutes and seconds. Scope Trigger - Channel 1 "FALLING" signal slope [ \ ] "IMPORTANT"
Now Connecting the 24 Volt battery bank to the device circuit not touching the "ON" or "OFF" 555 timer Potentiometer again. The circuit now defaults to a 50 - 55 % duty cycle, no further "ON" or "OFF" potentiometer adjustments needed. 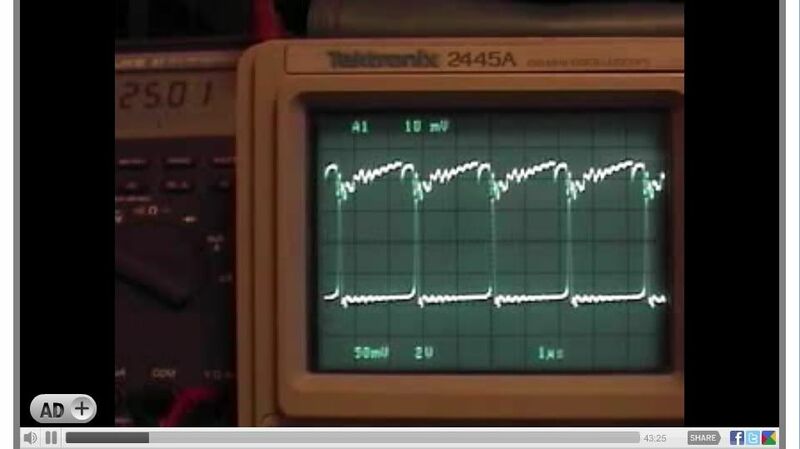 Now the double checking of the "GATE" potentiometer adjustment "only" using the oscilloscopes 100ns division for minimum Mosfet source Channel -1 Mean mV from 50 - 70 and the four (4) divisions from the 555 timer "OFF" signal to the Mosfet drain or 24 Volt Battery signal "spike" combined with the Fluke 87 DMM highest voltage reading connected to the 24 volt battery bank. The Mosfet circuit is now 100 % fully functional in the preferred mode of operation and under "load" the 24 Volt Battery bank Voltage is now at 24.70 DC Volts with no further adjustment to be made on any of the circuit potentiometers. A now recorded 24 Volt battery bank voltage increase seen on the Fluke 87 from the starting voltage of 24.70 to 24.72 DC volts. Now after approximately 5 Hours of continuous operation the 24 Volt battery bank voltage has dropped from the starting voltage of 24.70 to 24.59 Volts DC, a total decrease of .11 Volts DC , maintaining a constant 140 to 145 + degree F temperature on the "Load Resistor" which is about 5.5 watts continuous load. Glen, thanks for taking the effort again to post all this. I immediately see one big difference compared to what I did. I have everything connected at once, so the 24V battery on the load too. You do some initial settings on the 555 'before' you connect the 24V battery to the load and you don’t even adjust the ON/OFF pots anymore afterwards, only the gate-pot. Ok, I will give it another try tomorrow. I was trying to do some basic calculations on how long your two batteries can sustain a 5.5 watt load. I come up with about 104 hours, does that sound right? They are each 12Ah batteries so there is 24Ah of charge in them. A basic DC breakdown is 5.5W / 24V = 0.229A. 24Ah / 0.229A = 104 hours. So all we need to do now is run for more than 104 hours on those batteries and we have pretty good proof that we have extra energy coming from somewhere else And that's not even counting the lost energy in MOSFET or CSR to heat. Good Stuff! Last edited by Harvey; 05-02-2010 at 03:44 AM. I'm glad you liked the information on the January 9, 2010 video recording and you can find it useful. My hope is this will help you and other replicators to visually see whats happening with this simple experimental device that operates so complex. I'm sorry it took so long to do a detailed overview of the "LIVE" broadcast I did in the "Open Source Research and Development" channel on the January 9, 2010 5 Hour non stop video recording. This video as you are aware is one of the best ever recorded representation of the preferred mode of operation but only in a non stop 5 Hour video. I'm sure that many members and guests don't realize the difficulty in capturing this effect for the purpose of recording the data properly and if given the time looking at the recorded video everyone can see the problems that we face in getting accurate data. The constant 24 volt battery bank voltage fluctuations going up and down the Mosfet "drain" spike oscillating from 500 to 900 volts, battery voltage down the Mosfet spikes, battery voltage up the Mosfet voltage to normal operating range, back and forth over and over. I have tried to get as close to this mode of operation in Test #13 which was used in the IEEE submittal Open Source Evaluation of Power Transients Generated to Improve Performance Coefficient of Resistive Heating Systems the team including yourself did, and in Test #22 but never being able to record the data scientifically correct because of the circuits complex oscillating waveforms. 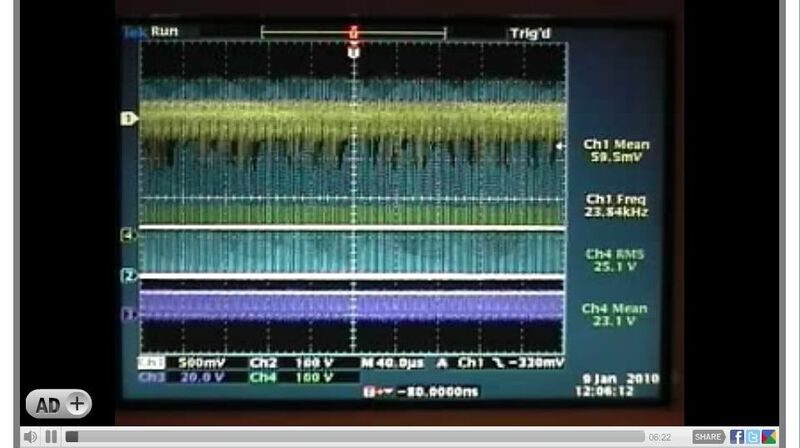 I don't think everyone, members and guests understands that the Test #13 was done with a Tektronix TDS 3054C which has a maximum resolution of 10K of data spread over a 10 x 10 grid or divisions so each one has 1k of data samples separately for each of the 4 channels. 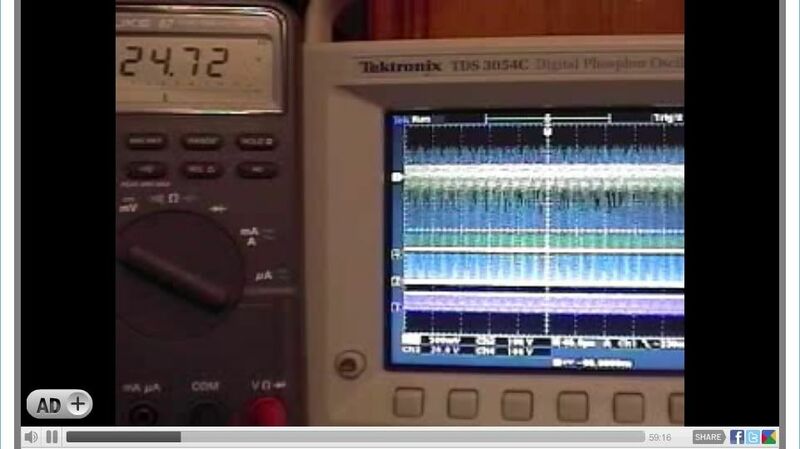 The data collected in Test #22 was with a Tektronix DPO 3054 which has a maximum resolution of 5M of data, but I used the 100K which is spread over the same 10 x 10 grid or divisions so each one has 10k of data samples separately for each of the 4 channels ..... ten ( 10 ) times the data of the TDS 3054C used in Test #13. The problem being we need to find a method of capturing the data continuously in real time, there's nothing wrong with Tektronix TDS 3054C or the DPO 3054 these are the finest instruments I've ever used and are extremely accurate, but if you push the acquire button at the wrong time you can appear to get conflicting or skewed data, not the case .... were you before the spike, during the spike or after the spike when the data was collected. I had a allotted dedicated set time to record the data, It was the time frame I used with the 6 minutes or as fast as the data could be physically collected with the finest equipment I had at my disposal. I am in total agreement with you that something "good" is happening in the Mosfet Heating Circuit and can be plainly seen in the recorded videos, we just need to somehow get a streaming real time data recording. 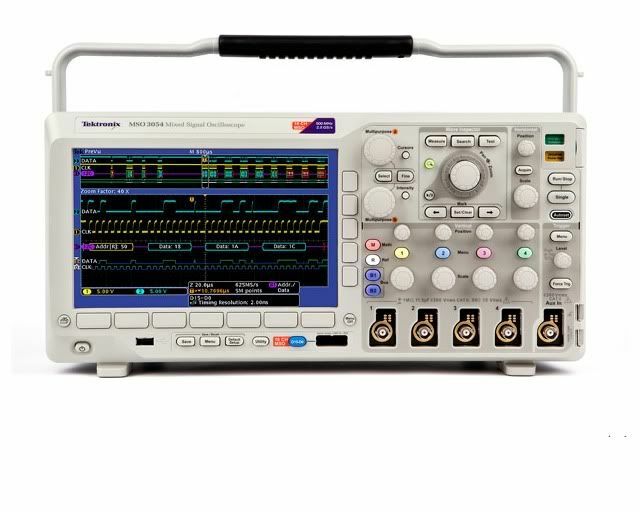 Maybe by somehow obtaining a Real-Time Spectrum Analyzers from Tektronix or some other method to verify the data findings as you suggested, the equipment I previously used as good as it is, just isn't enough to totally capture what is occurring during the preferred mode of operation. What is the impedance of the load resistor? r = (32mm / 2) / 25.4 = 0.625"
l = length of all the windings and spacing. 20 AWG = 0.032" = 0.8128mm thick, so the length = (48 * 0.8128mm + 47* 1mm)/25.4 = 3.39"
How does a square wave affect the impedance of an inductor? This was a trick question - Inductors do not have impedance unless coupled with capacitance or resistance. However, inductors do have impulse response and reactance, both of which can be affected by the slope of the waveform. This was introduced here to get people to understand that there is more happening here than even a basic classical AC approach can address. The risetime and falltime of the waveforms associated with the inductive-resistor play an important role in the actual instantaneous reactance. If the resistor was non-inductive, would the frequency make any difference as long as the duty cycle remained constant? No, the power relationships remain the same regardless of frequency as long as the duty cycle remains constant in purely resistive applications. So when is power delivered from the battery to the load? This is when the gate pulse is at a positve voltage relative to the MOSFET source pin. Note that there is a low voltage reading of negative 4.8V on the gate pin. 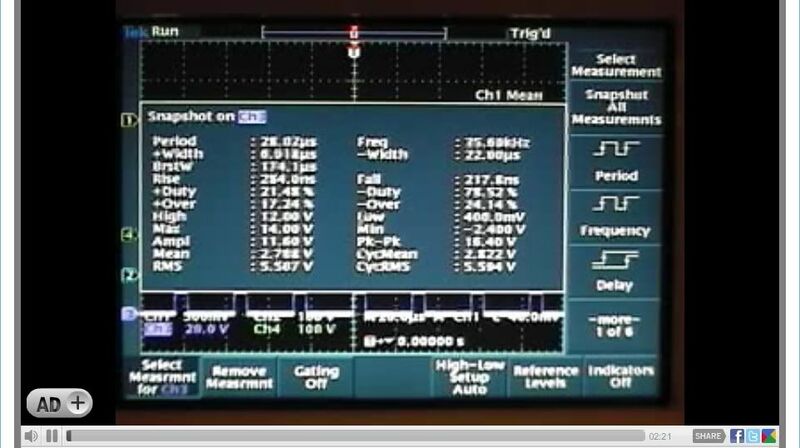 We don't have the MOSFET Source pin value recorded in the screen shot to go with that, but we do have the data dumps and we could look up what the source reading was when the gate was at that level. This may be an interesting exercise for you to do as it can enlighten you as to how a 555 timer can allow a negative voltage to occur on the output pin 3 and where that negative energy comes from. We find then, that when we apply the classical AC (or pulsed DC) treatment to Glen's Test #13, we expect to see a power dissipation of 1.46W and an overall power swing around 10.6W which is mostly apparent power. This is much closer to what the actual data showed, with a true average of 1.3W when we include the high resolution 2µS/div data, with the lower resolution 40µS/div data. Each of these samples were averaged independently, and then all of those averages were averaged together to reach 1.3W. That is about as true as we could get considering the entire test covered a full hour and we only have 0.00462 seconds (4.62ms)of data for the entire test. A lot can happen in the other 3599.99538 seconds we have no data for. Sure would be nice to have an RSA6000 to get some seamless data with. Now this puts us back to asking the question: If we are only showing, both by projections and by data, ~1.5W of dissipation, how do we account for the 5.5W of thermal output? Last edited by Harvey; 05-04-2010 at 06:45 AM. 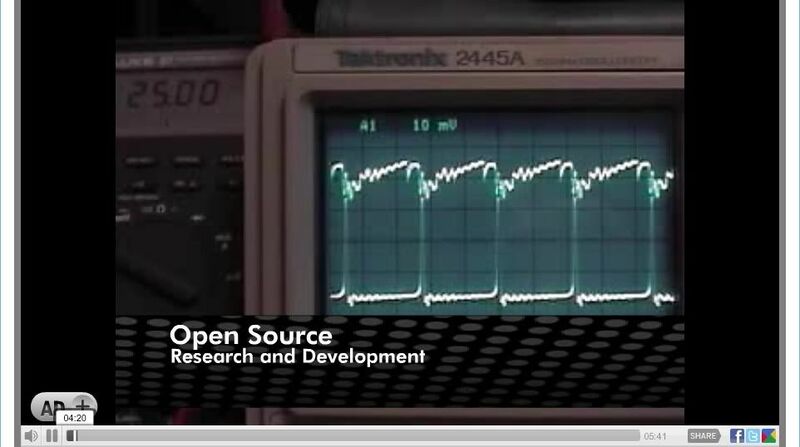 This post is a recap of a "LIVE" recording at "Open Source Research and Development" channel which was a 5-hour non stop recording on January 24, 2010 using a Tektronix 2445A Oscilloscope. Please see the Image time bars for actual recorded time in hours, minutes and seconds. Scope Trigger - Channel 1 (A1) "FALLING" signal slope [ \ ] "IMPORTANT"
Second the 24 Volt battery bank is connected, The circuit now defaults to a 50 - 55 % duty cycle, no further "ON" or "OFF" potentiometer adjustments are needed. 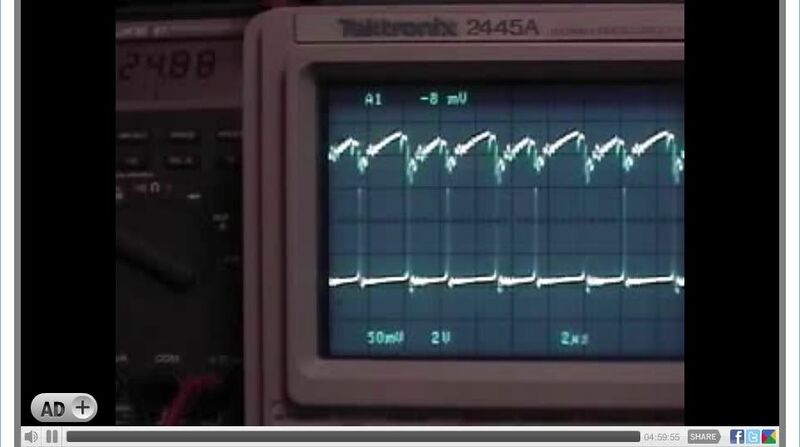 Then by adjusting the "GATE" potentiometer "only" using the oscilloscopes 200ns division for minimum Mosfet source Mv and two (2) divisions from the "OFF" signal to the 24 Volt Battery signal "spike" combined with the Fluke 87 DMM highest voltage reading connected to the 24 volt battery bank. The device circuit is 100 % fully functional in the preferred mode of operation and under "load" the 24 Volt Battery bank. Voltage is now at 25.00 DC Volts with no further adjustment to be made on any of the circuit potentiometers. A now recorded 24 Volt battery bank voltage increase seen on the Fluke 87 from the starting voltage of 25.00 to 25.01 DC volts. A look at all the circuit components and temperature readings of the Load Resistor, Mosfet and Shunt Resistor. 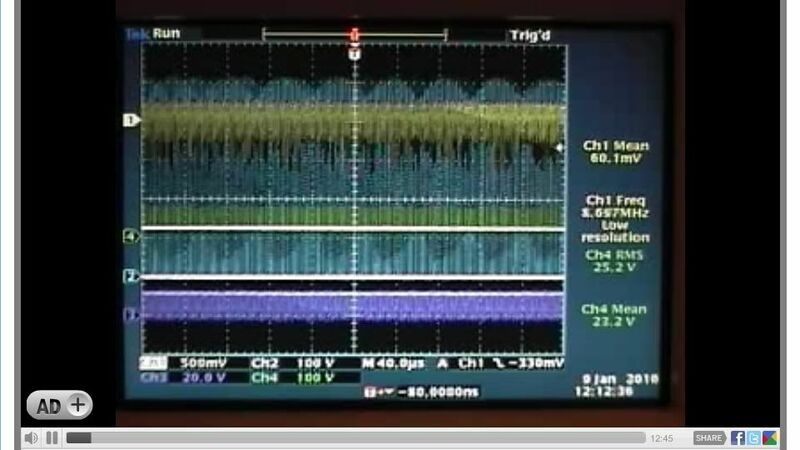 The oscilloscope at the 200ns division selection with two (2) divisions from the Mosfet source "OFF" signal to the 24 Volt Battery signal "spike" combined with the Fluke 87 DMM highest voltage reading connected to the 24 volt battery bank. Now after approximately 5-hours of continuous operation the 24 Volt battery bank voltage has dropped from the Starting voltage of 25.00 to 24.88 Volts DC, a total decrease of .12 Volts DC under load, maintaining a 140 to 145 + degree F temperature on the "Load Resistor" which is about 5.5 watts continuous load. I have the utmost confidence that those following my last two post regarding questions for Test #13 will have realized that so far I have only covered half of the AC transaction - the positive half of the cycle. So far we have discussed the dissipated power in the load resistor that we can attribute to battery power being delivered to it. However, we all know that there is more to the story. We have 9.14 volt-amps of apparent power involved that we really haven't given a fair hearing. We know, that after a period of time that the MOSFET is in the ON condition, that conventional DC current flows through the load resistor and if allowed to continue long enough, that resistor will charge magnetically in the inductive winding it possesses. This means that it becomes a DC solenoid and a magnetic field surrounds it with a B vector running straight through its center lengthwise. How long does it take to build the field and how much energy is stored in the field? There is a relationship between the electrical current and the building of the magnetic field. At time zero (0t) when we first turn on the MOSFET, 100% of the current is not yet flowing. At time one (1t), 63.2% will be flowing, leaving 36.8% not yet flowing. At 2t, an added 63.2% of the remaining 36.8% will be flowing leaving 13.54% of the overall current not yet flowing. At 3t, an added 63.2% of the remaining 13.54% will be flowing, leaving 4.98% not yet flowing. At 4t an added 63.2% of the remaining 4.98% will be flowing, leaving 1.83% not yet flowing. And finally at 5t an added 63.2% of the remaining 1.83% will be flowing, leaving 0.675% not yet flowing. So, after 5t we find that our current is flowing at 99.33% of its total value - therefore we generally consider an inductor to be fully charged after 5 time constants. You can go to infinity and it will never reach 100% because each addition of current flow is always 63.2% of the remaining amount. The formula for the forgoing is It = E/R (1 - e ^ (tR / L) where e is the natural log constant 2.71828. This resolves down to each time constant, t = L / R seconds. This is good for us, because we know the R = 9.73 ohms from Glen's Baseline profile test and we know the L in Henries from Back To Basics Part 2 as 0.00002277H. Therefore, we can easily calculate how long it will take for our inductor to reach maximum current flow. So that answers our first question - Glen's resistor is fully charged after 2.34µs from the MOSFET coming into full conduction. 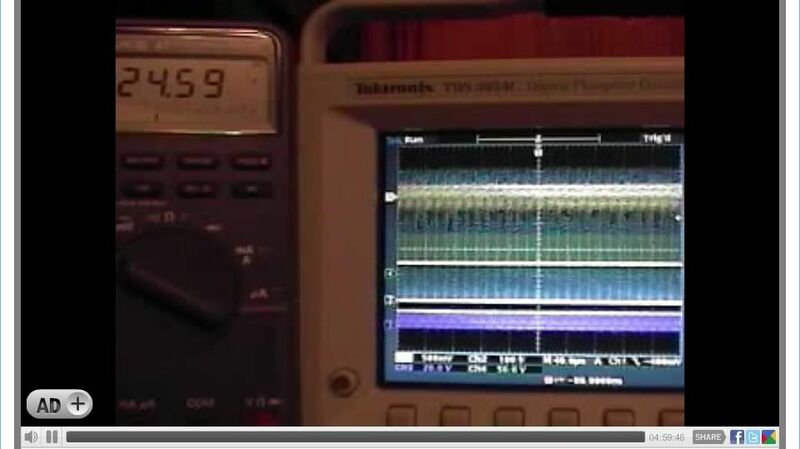 I looked up the stats on the IRFPG50 just for grins here and the turn on delay for this device is 19ns with a 35ns rise time under the test conditions of max current and Vdd = 500V. But we can probably safely say that from the time the gate goes high, the inductor is fully charged 2.394µs later. Now for the second question as to how much energy is stored in that inductor if we fully charge it. From this we learn that the energy stored is 1/2 LI². So in Glen's case it is 0.5 * 0.00002277 * 0.387 * 0.387 = 0.000001705120065 J or 1.7µJ. So if we are operating at 426kHz, how long do we have DC current building the field? That one is easy. Our full cycle time is the reciprocal of our frequency, therefore a complete cycle is 1/426000 seconds long, or 2.34µs long and our ON period is 57.32% of that or 1.35µs. In test #13, the inductor does not fully charge. If a full charge is 2.34µs, then 1t is 0.468µs. 1.35 / 0.468 = 2.9t or 94% Charged. We might add here that this means our stored energy is only 1.6µJ then. So this brings us to the other half of the transaction, the half where we turn off the MOSFET. And this is also where things change and must be analyzed differently. At this point we have 1.6µJ stored in the inductor as a magnetic field and we take the gate terminal low. The IRFP50 has a turn off delay of 130ns and a fall time of 36ns. So we can expect at 166ns delay from the time we signal it to turn off to the time the inductor begins to collapse it's field. This can be seen in the screen shots and the actual delay can vary depending on residual gate charge that is not scavenged away by the 555. We find that typically, the field is fully collapsed about 234ns later. So it charges in 1350ns and discharges in 234ns. At this point, the field is fully collapsed and has been converted to a voltage potential commonly referred to as a BEMF spike, at the drain of the MOSFET. There is a difference between BEMF and CEMF. BEMF is a voltage which when allowed to act on a circuit will cause a back flow of current after the magnetic field is fully collapsed. CEMF on the other hand, is a voltage which acts against, or counter, to an incoming voltage of opposite polarity in an AC system and causes a clash of currents. Simply put, the BEMF occurs when a switch stops current flow, CEMF occurs when the power supply polarity is reversed. So now, we are at the time where our BEMF spike is at it's maximum potential. The MOSFET is OFF. The voltage can only flow through one path, it must turn around and flow back into the load resistor. This point is very important: The BEMF seeks to distribute itself evenly throughout all the conductors connected to it. In this case, the conductors become charged evenly (given the time to fully distribute). So how much voltage would we expect in the BEMF pulse? Interestingly, this depends on how fast the field is allowed to collapse and how much energy is stored in the field. We can use this formula: E = -NdΦB / dt where N is the number of turns (48) and ΦB is the flux density in Webers and E is the electromotive force. Now, the thing to keep in mind here is that the electromotive force is across the coil, not across the battery. But how do we determine what our Webers are? One simple way is to relate it to the Joules we have already determined. A Weber is the same as Joules divided by Amps. Now doing it this way can introduce a compound error if we have made any mistakes in determining the Joules and good practice would demand that we use another approach so that we can compare the results. Perhaps someone would like to double check me on this by using another means like m^2∙kg∙s^-2∙A^-1. For now, let’s use the easy way. So we have 1.7µJ and 387mA: This gives us 0.000001705120065 / 0.387 = 0.000004405995 Webers, or 4.405995 µW. So now we can get back to our equation: - N ∙ dΦB / dt where N = 48 Turns, dΦB = 0.000004405995 Webers to Zero (that is our change in flux) and dt = 0.000000234 Seconds (that is our change in time). So what is our result? -903.79 Volts. Now to explain the negative in that equation: Remember my comment above that I said was important to remember? The -903.79V is across the coil and tells us something according to Lenz’s Law and that is why there is a negative on there. When the field collapses, the voltage is negative with reference to the voltage that created the field. Recall that we had a positive voltage of 23V across the coil when we created the field, and now, leaving our measurement equipment in the same place, we will see a negative voltage across the coil. How does this relate to the Battery? Well, for one thing, our Battery is our point of reference in Glen’s data gathering. And we have the interesting condition where our point of reference is isolated from the coil by the OFF condition of the MOSFET. Additionally, the very place we expect a negative nine hundred and three volts we leave that connected right to the Battery Positive. Now, we are either going to drive that B+ down 903Vor the other end of the coil is going to go up 903V but one way or the other we are going to see -903V across that coil. Well, as reality would have it, the Battery holds its own and clamps that end of the coil at our 24.77V relative to B- and this means the floating end (Drain connection) of the coil will go up to a +903.79V + 24.77V for a grand total of +928.56V relative to Glen’s ground reference. How much real dissipated power can we expect from the BEMF Spike? This is where things get interesting, because now we are 400ns into our MOSFET OFF period and at the peak of our BEMF spike. What will happen next? We have 1.7µJ of energy sitting on a small section of wire between the coil and MOSFET Drain just chomping at the bit to go somewhere. Recall that I said earlier that the BEMF spike is looking to distribute itself equally over the conductors attached to it. When it does, current flows back from the small piece of wire there, through the coil, to the battery plates. But this transaction is not happening at the lazy frequency of 426 kHz. No, this is where the slope of that falling voltage changes all of the dynamics. The fall is so fast, that to our coil it looks like a 2.5MHz signal (400ns wavelength) Now we have to go back to square one and recalculate our inductive reactance using that frequency to know what our impedance will be during the return trip, so we can determine our current flow and thus our power dissipation in the resistor. X = 2πfL = 6.28 ∙ 2500000 ∙ 0.00002277 = 357.67Ω. Z = √ R² + X² = √9.73² + 357.67² = 357.80 Ω. To determine the amperage, we now take our 903.79V / 357.80Ω and we get 2.53A. Now we can determine how much of that is dissipated from I²R, 2.53² ∙ 9.73 = 62.08W. Is that real power? Yes, but it is peak power of a sinus waveform and is reduced to zero watts over a 100ns period. So the RMS value would be 0.707 ∙ 62.08 for that 100ns period, or 43.89W. Now, it would seem reasonable to double this time, because we have to apply this same value while we are building the BEMF spike - in that case, it would be for 200ns for both the rise and fall of the BEMF spike. So how does this work out for one full cycle? We have 1.46W during the entire ON time and we have 43.89W during 200ns of OFF time and relatively zero watts during the other 0.974µs of OFF time. This comes out to an average of 4.47W of real power dissipation for each full cycle of the MOSFET. So we are still about 1W short of the thermal output recorded during the test – where does that extra energy come from? Where does the extra watt come from? One thing we know about this circuit, is that it is very aperiodic when operating in its preferred mode of oscillation. This means that the frequency is always changing. The calculations I have done in this Back To Basics three part post are on one single cycle, 2.34µs based on a snapshot of the real events. As mentioned in part two, there is a huge area of time that we have no data on and cannot say what is really happening there. We found other spikes in Test #22 that are too narrow to be picked up with the 10,000 sample resolution even at 2µs. So, it could be that the extra watt is buried somewhere in those unrecorded time intervals. The opposite could be argued as well. The unrecorded time intervals could demonstrate that when 100% of the data is collected together uninterrupted that we really may have no classical explanation for where the extra energy is coming from. I look forward to new tests giving us uninterrupted data capable of proving the case either way. One such test would be an endurance run that exceeds the capacity of the supply. 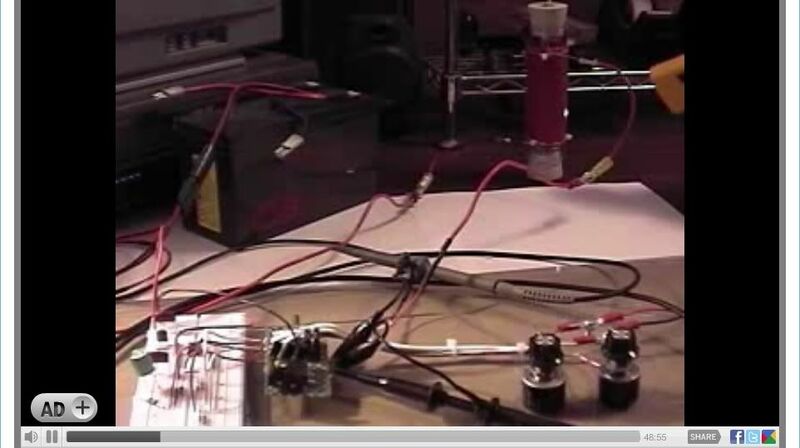 Another test would be to run the device from a monitored power source with a BATCAP filter and a calorimeter cabinet (the entire circuit contained so all thermal energy is counted) – this would be easy to see over an extended period of several hours exactly how the input power relates to the output power. H, Glen this is brilliant info, i have already started putting a video production as thank you and quick start for this, the open source community really owes you guys a MASSIVE DEBT. Thanks so much for these posts guys. I have to thank you for very gently pointing out to me that my coil is part of a capacitor discharge system - this is now glaringly obvious to me, and I have spent some time in the last two days trying to talk to the right engineer at Evinrude/Johnson to get the data on this component -with no result. The motor it came from had a separate cdi module, so I automatically assumed that the cap was in the module, and that the coil was just a coil. Another of my litany of mistakes.There must be some cap inside it. I turned the diode around, and the on time of the spark gap increased substantially [more power ,as you predicted], but the ringing was very much less, and its the ringing thatI am interested in. The capacitative spike disappeared except for the shoot thru .The Tau is very evident in the decay of the ringing. To get back on topic - the circuit you drew for me, was my effort to to find out what happens to the body diode in a mosfet heater circuit. I use a circuit very similar to the one discussed here.I have a lot [20years] of practical experience with liquid lead acid batteries, and I reckon that the batttery is a fundamental part of the cicruit. You will not get the effect with a power supply. 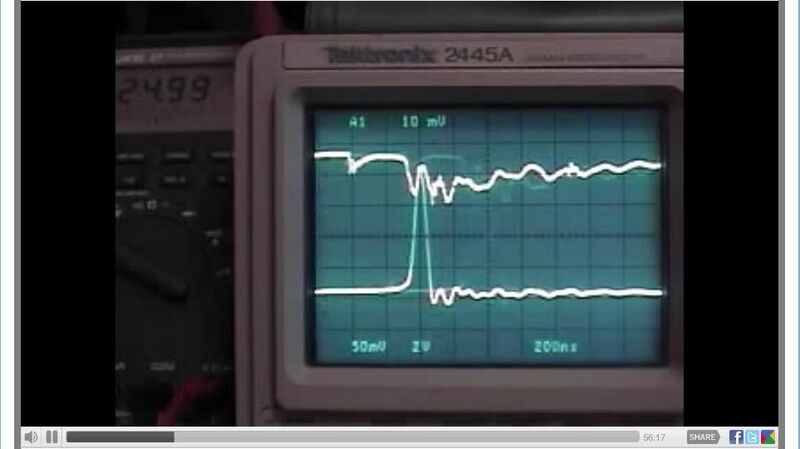 A liquid lead acid battery has low impedance and is capable of resonance - look at the ringing in the battery voltage in Glen`s fantastic scope shots. A liquid lead acid battery is not amenable to a strict mathematical analysis - a few crystals of PbSO4 fall off a plate during discharge, and suddenly you have increased voltage. To the knee in the discharge curve , you can use voltage as a guage of state of charge, - but I have yet to find it a straight line.I regularly discharge batteries from 12.8v to10.8v and the specific gravity of each cell will have dropped from 1.26 to 1.24 during the discharge, and if left unrecharged for 2 hours, will drop to 1.22 while the voltage will have risen to 11.8 at least. A lot of people cannot understand that a battery @11.8v is dead flat! Also, pulse charging is definitely more efficient than brute force DC charging, where a lot of energy is wasted as heat. I think that if you can match the resonant frequency[ or a sub division of it] of an inductive resistor, to the resonant frequency of a battery, - there can be effects worth looking at. I do this with large batteries [100Ahr] @ low frequency. I keep a radio 2 feet away from the resistor, and when it starts squealing, I know I am getting near - and then the mosfet fries.- I have fried over 50 mosfets, and I blame the body diode. And yes, I know i am operating the mosfet way beyond its ratings, but I reckon the diode cannot handle the energy being bounced off it. Glen, I would like to ask you if, once you hit your "sweet spot",do you have difficulty in maintaning it, as the resistor rises in temperature? It does not seem so from your description of start-up. You are operating at a much higher frequency than me , which may give greater stability. All I want is a switch that can handle vast power, reversals of polarity, at any frequency - is that too much to ask!? Sooner or later, my large IGBT will be called to the frontline, but not before I think it has a fighting chance - it has a body diode too. Another effect, before the mosfet fries, is that my mobile phone will switch off from over 20 feet away, and this worries me . I want shielding, but from what? -RF ? Microwave? X-Ray!? - of course ,if infra red is a large part , then we are in business! The MOSFET Body Diode is actually a by-product of how those devices are manufactured. The internal structure makes a naturally occurring diode junction between the source (anode side) and drain (cathode side). In addition to this, some devices also have an Avalanche rating where that diode becomes conductive above a certain voltage. For the IRFPG50, that voltage is 1000 volts. So above 1000V the MOSFET simply turns itself on hard and dumps as much as 800mJ of energy straight through in one fell swoop - or repeatedly, 19mJ. Now those values were obtained with very specific parameters, like a 50V VDD, 40mH Coil, a 25Ω Gate resistor and a maximum IAS current of 6.1A. But they do give an idea of the maximum power can be dumped through the device and still have it survive. The IDM (pulsed drain current) can be as high as 24A, and the continuous drain current can max out at 3.9A if the device reaches 100°C. So even though it is robust, it still has it's weaknesses. Another critical area is the Gate to Source voltage. This is a CMOS device, and the Gate is susceptible to ESD. The limit on that is +/-20V relative to the source pin. So if you have a circuit that the source pin floats up to 24V and the gate is held down at ground, you just popped the FET. Conversely, if you drive the Gate to +24V and the source is clamped at ground, it will pop the FET. Also, these devices really need the temperature to be controlled. They can get real hot real fast if not properly dissipated via a heatsink or the like. So the Body Diode can be viewed as a large 6.1A Zener Diode built inside. When the diode is forward biased (negative voltage on the drain relative to the source), there will be a 1.8V drop across it's junction. That is the minimum drop. So in that condition (like a ringing that goes negative) the diode will conduct and short the ringing to the source pin. At full pulse current of 24A, that means the device is dissipating 43.2W in that diode. The case allows for 190W dissipation if properly heat sunk. Any time that happens, you are wasting energy. (unless the MOSFET is your heater ) This is why I suggest floating the inductive ringing above that level to prevent the damping if you are using it to heat the inductor, or feed a bridge charger take off node. For example, if your Peak to Peak ringing voltage is 100V, then put your supply at 60V to keep the bottom peak above ground. The IRFPG50 can easily support ringing of 990V, so a 510V supply would work fine for that and all of the energy would be returned to the inductor. This way the MOSFET stays cool, the Body Diode does not have to conduct in either direction and all of the energy stays with the inductor to be dissipated or taken off for charging. Although somewhat unconventional, the inductor can then be the primary of step down transformer. With a 500VDC supply, the MOSFET can pulse on in phase as the ringing begins to decay and keep the Primary ringing continuously near 990V +/- 100V perhaps. The secondary can then be used to AMP up that energy at a lower voltage and apply it to do work. The frequency is only limited by the components and RF losses due to their geometry. At 24A of pulsed DC current (just to charge the inductor back up to ringing) you could get as much as 16KW pulsed energy through the transformer. Of course at 24A, the power dissipated by the transistor would spike to 1152W and the device can only dissipate 190W. So this can only be achieved if the device is operated below the thermal impedance margins. Frequency durations longer than 0.1 seconds are reaching the limits for all duty cycles, while a 10% duty cycle with a frequency duration of 10µs (100kHz) is at the bottom end where things are cool. So between 10% and 50% at 100kHz you run the full dissipation range with this device. So while the above sounds enticing, there are some very real limits that preclude even a 100kHz pulse at 24A while we may think it is within the maximum ratings. A more realistic approach would keep the current below 6.1A for safe measure. But even then, we are looking at 4KW at the transformer. I²R tells us the power in FET, where it is 2 Ohms ON, to be 74.42W if the current were continuous DC. So it would get pretty warm even during normal operation. Devices with lower on resistance, or parallel MOSFET's can greatly reduce that dissipation loss. We could probably help you solve the burn-up problem you are having if we had more information on the specifics of how they are being applied. We are now in a long waiting period for any actual or credible circuit "replications" to be constructed and help verify the detailed data and video findings that has already been done by Harvey and myself. There is several actual applications using other "resistive" load devices that are being looked at for any possible use that could be of benefit using the circuit modified even further for higher wattage applications with new technology on experimental items such as Oxyhydrogen ( HHO ) production to off the shelf items such as this "water heating" element. Are their any specs as to the inductance or is that just purely a resistive type element? I guess what I am asking is; can that style somehow resonate in the desired frequency range? It looks like it would be made for a low frequency like 50 or 60 hertz but I would need the sizes to be sure. I really like the design you show here where the one lead runs through the center of the coil - I've seen others where it runs outside and that just seems so unbalanced and problematic. Your work is always given at 100%. I haven't gotten the full specifications from the manufacture yet but it is a 240 volt 1000 watt unit and I'm trying to find a lower voltage product with the same element configuration. Hopefully it would be something that's "off the shelf" and not custom built which would be preferred and still using the modified circuit to drive the "resistive" element upgraded for the loads connected. 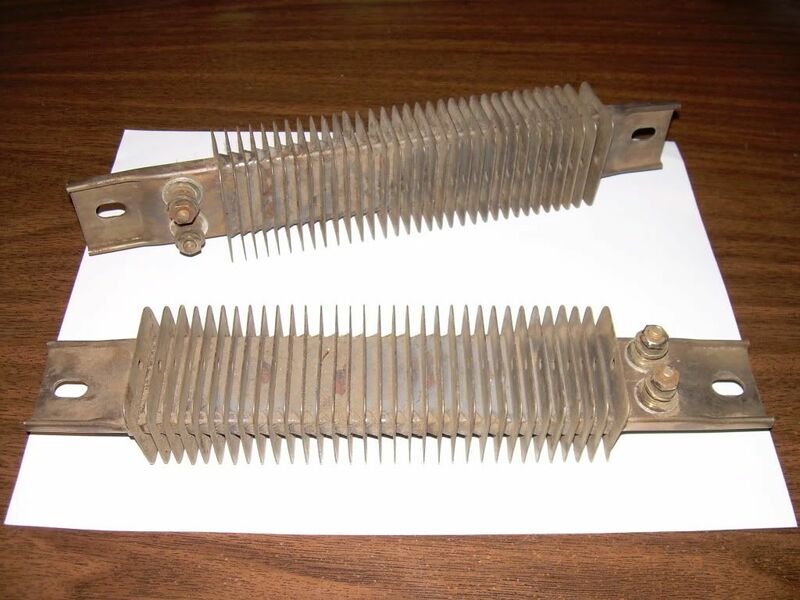 Here is another "resistive" element (used needing a good cleaning) which is a finned strip heater, these are 20 ohm, 120 volt, 725 watt, stainless steel, 925 degrees F. maximum temperature. I'm still acquiring some components to duplicate the modified circuit and device used in all the Tests 1 through 22, so I can keep the "original" intact for any possible future use. The problem, in a battery powered system, is to boost the battery voltage to 240V in a 1kW configuration. Of course the simple answer would be 20 batteries in series and that is not all that far-fetched in real world applications I have seen. However, a 1kW Inverter could be used as well but such approaches inevitably add unwanted losses to the system. Another approach would be to use a voltage multiplier front end that typically has lower losses associated with it compared to the inverters. Of course a single 700Ah car battery would only give you about 8 hours of operation before needing to be recharged if it were feeding a 1kW heater. I installed a 120VAC Hott Rod heater in my Dads hotwater heater in his RV and that was a very easy thing. It does not run continuously because after the 6 gallons are heated up it only has to maintain it (unless of course you bath and then the process must repeat). It takes his about 20 minutes to heat up to 125°F from a cold start of about 65°F water temp. They advertise 45-90 minutes but I don't know if that is in cold weather or what. So, what ever the calories to do that heating of 6 gallons in that time period gives an idea of the energy used. He has a 2kW inverter that he uses to run that when he is remote but I think it is about 400W that it uses. I've heard of people in the outback running these strictly off of solar energy. I installed 3 solar panels on his rig, but they are only 15W each so it takes about 3 hours of sunshine on his system to get a single 6 gallon heating based on 400W * 20 minutes = 8,000W minutes. So 8,000W minutes divided by the 45W solar recharge gives just under 3 hours. He uses the rest of the recharge time to prep for TV watching etc. at night. He rarely uses the generator or engine to recharge anymore - but he does need those for AC or Microwave use. 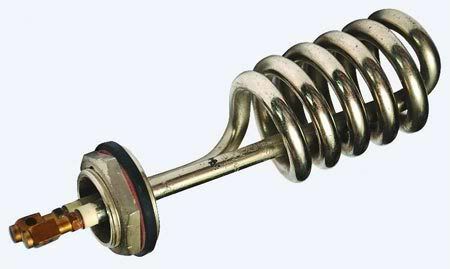 This is a relatively high amperage part with an extremely low on resistance. Hi guys can you post the latest circuit for a 1000w or 2000w heater? The circuit is basically the same, but the voltage needs to be increased while keeping the amperage the same. The IRFPG50 can tolerate upto 1000V before it goes into avalanche. As long as the current is kept at 6A, the MOSFET thermal dissipation will not change because the internal resistance of the MOSFET is always about 2 ohms when fully powered and the voltage drop across that will be the same for a given amperage. So, the target configuration will be a 2kW heater at 6A and the necessary supply voltage for that power dissipation. The net impedance will need to be about 55.55 Ohms and the voltage will need to be about 333.33V. So, let's imagine 6 of Glen's resistors in series and a 3kW power supply at 360V. This gives a practical current of 6A and 2.16kW of output power. How do you get a 3KW supply? These batteries have a through current of 30A continuous and 2100W by themselves. So 10 gives you twenty one thousand watts of power available or the ability to run a 2kW heater for about 10 hours straight. So the only real changes you need to make to Glen's Modified circuit is to ensure the electrical paths can handle the 6A and 360V. Of course the duty cycle is only about 50%, so the actual room heating from the dissipation will be half as far as true BTU's go and the actual battery drain will be 20 hours instead - maybe . . . it all depends on that aperiodicity - the real BTU's could be drastically less if the average dissipation is less than 50% depending on the integrated spike area and dissipation of that spike into the load. EDIT: I made an error in those calcs - the battery capacity is 1200W not 2100W - you may wish to adjust my calcs accordingly. Last edited by Harvey; 07-17-2010 at 12:26 AM. Hi Harvey you're reffering to these posted schematics when you said circuit is basically the same?